After the loss of a few regulars and no one else wanting to keep the team going the Bandits folded. For the next season, 2004/05, I played for Peter Plummer's B-division team: Buzzy's (after Buzzy's Jerzee City) Wild. We had jerseys in the Mighty Ducks style but with a screened crest, that was sewn on, of the Minnesota Wild's logo but in the Ducks colour scheme. The team he was also running on the A-Side was the Wolves. They had acquired a team set that the Fort William Wolves had used when they were in the SIJHL (the team had changed names to the North Stars). The jerseys for that team were in the Islanders 'fish stick' style with the odd shaped numbers but with a front crest of a Wolf's head. 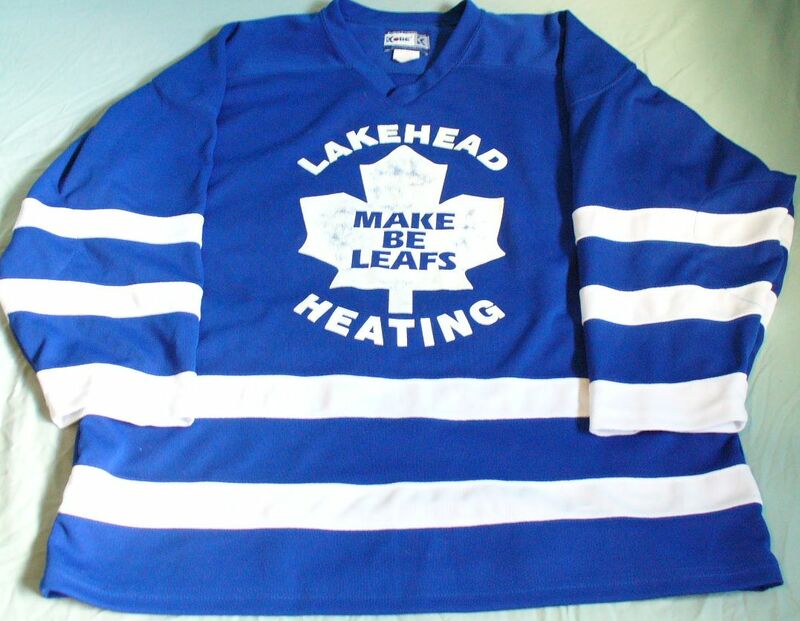 The following season, 2005/06, I spared for the 'Make Be Leafs'. I used a blue and a white Nordiques jersey when playing for that team. I later acquired a team jersey at a local thrift store. After the Leafs, I ended up the next two seasons on the Polar Mechanical (previously Galaxy) Flyers. Many of the team had the Galaxy orange jerseys. Others had different orange jerseys. I made up a few jerseys for myself and sold a couple to some newer players. I am beside the goalie in the picture wearing a jersey with a yellow bi-plane in a circle with the Polar Mechanical logo beneath. 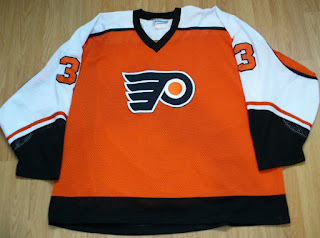 I sewed a Philadephia flyers crest on a jersey and made and sewed on #3's. 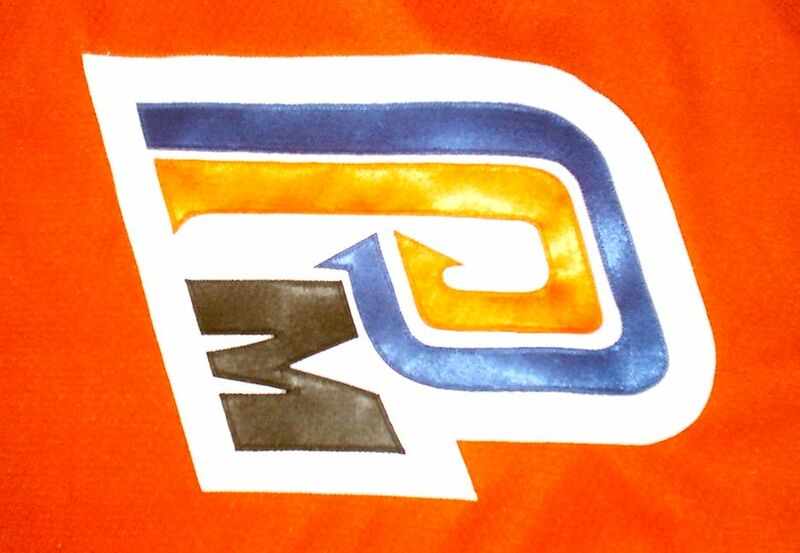 Plus I made a Polar mechanical logo on one jersey similar to Philadephia's logo by turning the 'P' in Polar Mechanical's logo sideways and adding a 'M'. My dad or wife recorded a few clips of a game. Maybe on his video camera; more likely on a digital camera they had at the time (considering how short the clips are). After the 2007/08 season with the team ending with a 2-26-2 record and 0-4 in the playoffs the players decided to not play in the league past the end of that season. With the team having the oldest average age of players, the loosening of age restrictions in the league, and the league dropping from two division down to one, it really wasn't as much fun for the team anymore. I looked into the team joining the 35+ age Centennial League but their 4 team league did not want to expand. I played with the Flyers in 2008/09 on 'scrub' aka 'pickup' hockey where the Flyers team played against a Hansford Insurance team Thursday nights. I think they still are doing so. After 2009 due to regularly working nights, I was unable to join a league team even if I had wanted to. Even though I was one of the younger guys on the Flyers, I was probably well above the average age in the league now and not exactly anywhere near in top shape anyway.